Farm Pond is my technical masterpiece. It contains 31 colours of ink, printed in two different directions. It took 2 years to complete. 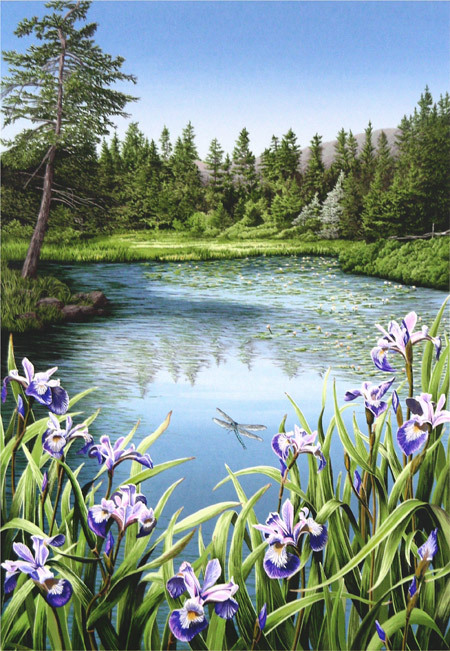 It depicts the Westerland Farm Pond. My Uncle Harold McPherson raised Newfoundland Dogs on the property. It was a wonderful place to visit and picnic. When you look at this piece, think of jello salad, with fruit and marshmallows. Sheila the Newfoundland dog is ready to shake the water on you!